A recipe for soft and tasty mini meatballs. You can eat them as they are combined with fresh salad or additionally make some sauce, eat them with baked beans, mashed potatoes, rice etc - they go perfectly with everything. Mix minced meat with onions and garlic. Add spices, soda, salt and parsley and the egg. Mix well everything. Leave at least half an hour in the fridge, then shape the balls in a ping pong ball size. 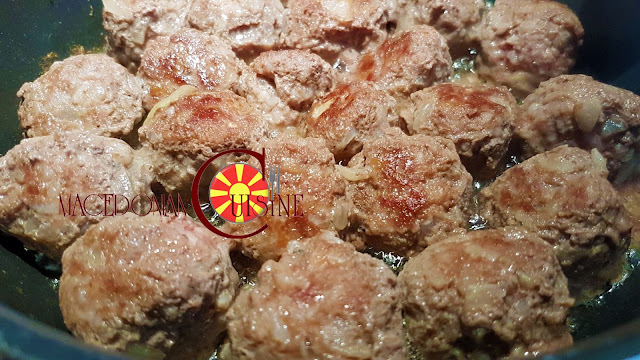 Fry meatballs in hot oil. When done, remove meatballs from the pan and align on a kitchen paper. Note: Many times I add a little bread (the soft part) dipped in milk to the mixture. It makes the meatballs even softer and fluffier, try it!